This 1920s hair slide measures 8cm by 6cm, and features an embellished floral art deco design. It has central faux pearls and is made from a gold plated brass. This art deco style headband is plated silver with an off centre, beaded design. The embellishment measures 10cm by 3cm and features a mixture of clear, sparkling crystals and ivory faux pearls. This is a 1930s style hair comb in gold featuring a variety of sized diamantes in swooped deco design. 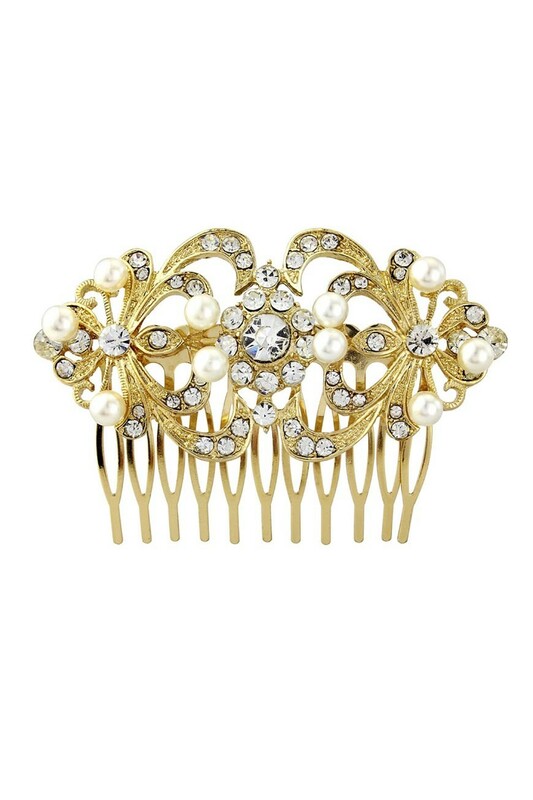 This embellished art deco hair comb is gold plated with a design measuring 8.5cm by 4.5cm.